Many of these books in the Internet Archive include photographs, pictures, maps and other images but since the books are treated primarily as text, there has never been an easy way to find them. Posted in Sites We Like. The Massachusetts Board of Library Commissioners is celebrating 125 years of service this year. Established in 1890 as the Free Public Library Commission of Massachusetts, the MBLC is the oldest state library agency in the country. To honor the past and look forward to the future, the MBLC has created MBLC Celebrates 125 Years, a site with pages for each of the 125 years, giving highlights of Massachusetts library history and notes on historical, social and cultural events of each year to provide context. 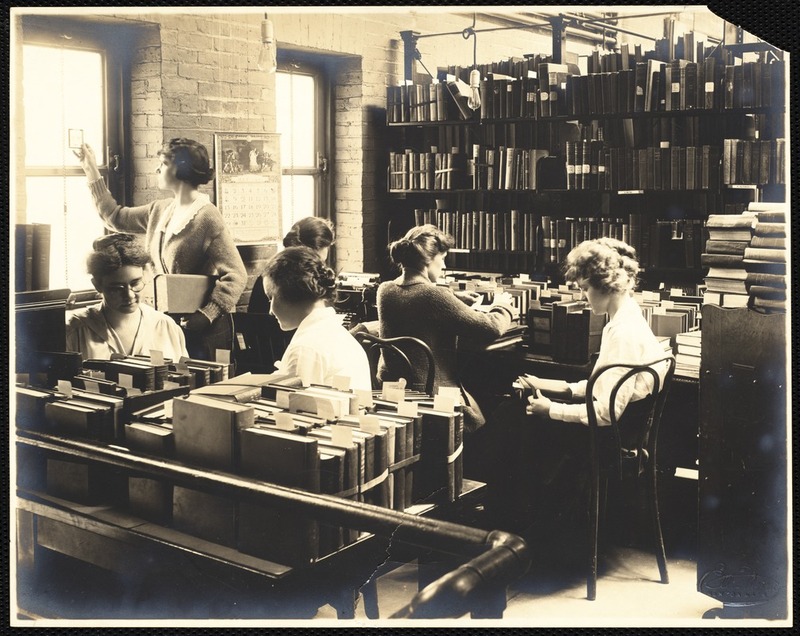 There are also lots of great images from the Digital Commonwealth and other sources, including the photograph of Technical services librarians at the Newton Free Library from the Newton Free Library, Old Main Library, Centre Street, 1880-1971, collection shown above, and the 1893 Massachusetts library map from the collection of the Norman B. Leventhal Map Center at the Boston Public Library shown below. You can follow this site a year a day on Twitter or Facebook, or visit it anytime and browse your way through the decades — there’s a lot of interesting information here!